How To Drive Blog Traffic From StumbleUpon? Home > SEO > How To Drive Blog Traffic From StumbleUpon? StumbleUpon is one of the biggest social bookmarking website used by millions of people daily. Social bookmarking is a way to keep store any website links safely at online and to make it remember anytime you want. Nowadays social bookmarking sector is becoming very popular to increase networking, popularity, traffic and web rank. And at the time of writing I have found, currently StumbleUpon has 14 million registered users and more than 500,000 new users join to StumbleUpon every month. After signing up at StumbleUpon you will be known as “Stumbler” You need to click Stumble button and when you get a website that you’ll need to use frequently you can bookmark it. So, if a website gets more stumbles that website will get more traffic from StumbleUpon. 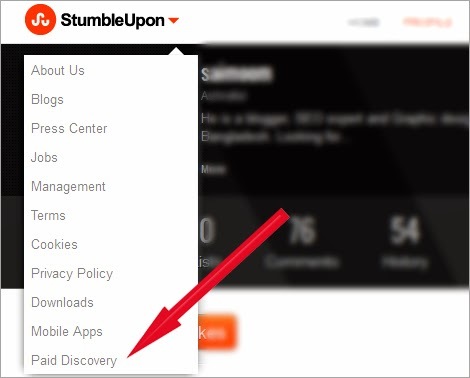 The members of StumbleUpon can recommended your website by clicking on Stumble button. They can also thumbs up or thumbs down if they like or don’t like respectively your website. To get quick traffic try to write How to tutorials, Best tips and tricks and quality lists. SEE ALSO: How To Get Traffic From Facebook Pages? StumbleUpon has a browser StumbleBar that allows you to stumble websites and rating options. This toolbar is not essential, if you would like to use this you can download it. If you click “I like it” button a new tab will open to rate the website. This record will be saved in your account database and when other users come on with same interest they will see your likes. How To Get Backlinks From YouTube? StumbleUpon also offer advertising opportunity to drive more traffic on your website. This is a best option for getting traffic to your blog. All you need to do to select a site where you want to get the web traffic. You can setup your daily reaching limit. To get started with paid advertising simply go to your profile page and click paid discovery option. On paid discovery page you can choose your suitable plan. If you are a starter in blogging platform this might be great way to promote your site globally. SEE ALSO: The Planning Between Paid And Free Traffic. At conclusion, try to get stumbled your site as much as possible. I want to tell one more thing is don’t attach yourself only with Facebook and Twitter for marketing yourself or your products. Remember there are lots of social community sites available to promote your online business. Have a nice time with best stumbling. Good bye friends.